Hanover Square Press, 9781335936639, 320pp. Modern humans have come a long way in the seventy thousand years they've walked the earth. Art, science, culture, trade--on the evolutionary food chain, we're true winners. 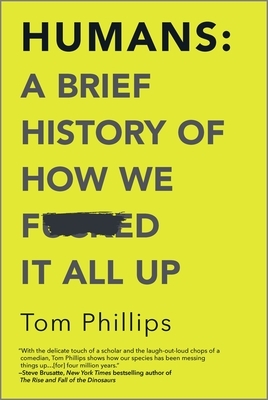 But it hasn't always been smooth sailing, and sometimes--just occasionally--we've managed to truly f*ck things up.Weaving together history, science, politics and pop culture, Humans offers a panoramic exploration of humankind in all its glory, or lack thereof. From Lucy, our first ancestor, who fell out of a tree and died, to General Zhou Shou of China, who stored gunpowder in his palace before a lantern festival, to the Austrian army attacking itself one drunken night, to the most spectacular fails of the present day, Humans reveals how even the most mundane mistakes can shift the course of civilization as we know it. Lively, wry and brimming with brilliant insight, this unique compendium offers a fresh take on world history and is one of the most entertaining reads of the year.